Seal-Spout is a fourth-generation family-owned and -operated business. Henry Brucker, born in 1874 in Newark, New Jersey, was the oldest of nine children and at the age of ten assumed the responsibility of family provider because of the death of his father. In 1910, he established American Aluminum Company, where he manufactured lathe-spun metal parts. In 1929, Mr. Brucker was approached by International Salt to help them automate the insertion of their pour spouts in to their paperboard cartons, which until that time was done by hand. Mr. Brucker revolutionized the packaging business by automating the inserting of spouts and the manufacture of spout blanks. He grew the pour spout business through continual innovation in the design of his pour spouts and spout inserting machines. In 1944, Seal-Spout was spun off as a separate business. Today, Seal-Spout is the industry leader in the manufacture of metal, aluminum, plastic and paper pour spouts and spout inserting machines. 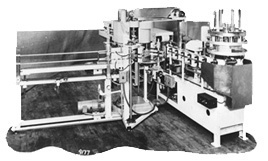 Photo depicts a Model 12 Spout Inserting Machine integrated with a vertical filling system. Appearance, Efficiency, Lower Cost and High Performance are the four qualities that drive the development of every Seal-Spout system. This simple but important formula provides the foundation for every customized solution we design. Our high quality standards result in custom-engineered packaging line machines that are highly reliable, precise and durable. Seal-Spout machines are reliable, with many units in operation for more than 25 years. Seal-Spout customers have described our machines for us: "Rarely needs maintenance"; "speed of the machine exceeds our production needs"; "absolutely consistent ", "using the same machine over 25 years, and still going strong". Seal-Spout spout inserting machines are accurate, consistent, durable, efficient, fast and easy to maintain. Our service record is remarkable, with a 100% Service Record Guarantee. Since 1944, we have never received a service request for a part that could not be fulfilled the very same day. And regardless of where your plant is located, Seal-Spout support is only a phone call away. The Seal-Spout team works with your engineers and management to design a solution that fits your individual requirements, and adapts to any application. Our engineers have existing relationships with production-line equipment and machine manufacturers, such as Clybourn Cartoner, Yeaman Machine Technologies, Triangle Package Machinery Co., Tisma, and ACMA, as well as others. Our machines are be custom-built, as necessary, and it is not uncommon for a Seal-Spout inserting machines to be in use for up to 30 years. At Seal-Spout, we are a family business, and our extended family is our staff and our customers. Our friendly staff is on a first-name basis with many of our customers, some of whom we've known and done business with for 30 years or more. Our knowledgeable mechanics not only build machines for our customers, they also provide expert support in the rare case where there is a need. We care about our customer's customer needs as well; we'll work to provide customizations to satisfy the ultimate end users of our spouts. Seal-Spout is committed to your privacy. We will not share your information or data with any third party without your consent.